This may surprise you but I’ve never met a selfish person. Each of us believes in the “common good” for all and each of us believes how wonderful and benevolent each of us is. Ahhhh. The season of Lent can be practiced as our U.S. culture can be practiced – being selfish, thinking only of ourselves. We examine our own little, personal lives during Lent in preparation for Easter’s redemption. “Look inside your life” is Lent’s yearly command. In our culture we can be self-centered in attitudes contrary to our basic beliefs about the care and concern of that “common good.” “The ‘common good’ is good as long as it doesn’t affect me” is our internal feeling and thought. “Get the government out of my life but don’t touch my Medicare payments,” is such a contradiction that it’s laughably sad. “Not mine but ours” – ought to be our mantra in both church and society. “Just think of the poor children in Biafra,” mom told us in the 1950’s and you’ll feel better about yourself and eat the crazy vegetable left on our plates. The five of us had no idea where Biafra was and we couldn’t recall meeting any of them in our small Manitowoc town. How our mom even knew about that African country baffles us to this day. “Did I miss meeting one of the Biafrian kids on my way to school?” we thought to ourselves. We use others to lessen our problems and the worst part of all is that we get away with it. It happens often. And it happened to me recently when walking through the hospital’s ICU to visit someone; I thought to myself how petty was my crying and lose of two cats of eleven years and putting them to sleep because of their age and organ failures. “Who was I to lament?” I thought when I saw someone wired with numerous cords surrounded by hissing, digital machines. The salve of that hospital comparison worked on me until driving back to work and realizing that I found a more unfortunate person to soften my misfortune. Our five Manitowoc kids knew no one in Biafra nor could we locate their country on a map but we trusted our mother’s balm comparing people living in utter poverty with our failed grades or lost friends or no TV for one night.” Fair comparison? Comments like that make our lesses less and keeps their lesses less. We need “them” to bolster ourselves. If there was no one lesser then ourselves then how would we ever release ourselves from grief or sorrow? My pain was softened by the greater pain of someone else. How great of me to feel this way. What a great country to condone those lessers to enjoy our more. Jesus didn’t bring Lazarus back to life because they were best friends and Lazarus missed a planned lunch. Jesus brought Lazarus back to life because he wanted to show us that “new life” happens in all shapes and forms. It is because of Jesus, the cross. Lent may begin with the “selfish me” but it has to end with a collective “us,” the Body of Christ or else this whole thing we call “church” is meaningless. The “common good” that is good and obviously common among us all begins with us, individually and then expands to our nation. Comparisons rarely work and many comparisons can be downright hurtful. So, today, in front of all of you, I’d like to publicly thank all the Biafra, Africa folks for their poverty, their injustices and all the wrongdoings done to them. Have we lost the meaning of the “common good” or a sense of perspective or did we ever have it in the first place in our Lenten lives? Mother was right. 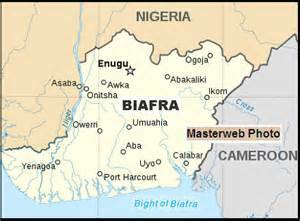 Biafra has truly comforted and soothed me through all my First World troubles and struggles – like missing a meeting, like being late for work, like wearing the wrong tie or like losing my two cats the same day. This entry was posted in Spirituality and tagged Bafia. Bookmark the permalink.